Here at Tuntum we want each and every resident to be happy with the service that they receive from us, and that means listening to what you have to say. We believe that listening to and involving our residents in the running of the organisation is vital to our success, so we can focus on the areas you tell us are most important to you. Below is a list of ways you can get involved with us. Magnify is our residents’ scrutiny panel. They work together with Tuntum staff and its Board to look closely at all aspects of its service and make recommendations as to how improvements can be made. Click here to learn more about the work Magnify does, and how to get involved! We work hard to try and give you the best service we can at all times. But we’re only human, and sometimes we make mistakes. In order to try to resolve problems and disputes between landlords and tenants, we have joined forces with Derwent Living to form an award-winning Tenant Complaints Panel. If you are a good listener, a resolution-seeker and can spare four hours per month, why not apply to join? Full training is provided and expenses such as travel are covered. Contact us or call 0115 916 6066 for more information. There are times when we want to discuss an aspect of our service in more detail with residents, and focus groups are a great way for us to find out your opinions and hear your suggestions. We have run focus groups on things like our repairs handbook, our business plan and our website. Please contact us if you are interested in finding out more. We publish our newsletter, Engage, three times a year, and we welcome articles or ideas for articles from residents. Contact Alanna Irving or call 0115 916 6084 for more information. You can read previous issues of Engage here. Like us on Facebook and follow us on Twitter (@TuntumHA) to keep up to date with available housing, news and events at Tuntum. If you live in one of our temporary housing schemes, get involved with a scheme meeting. You could also arrange coffee mornings or other social events. Contact Delores Vassell or call 0115 916 6069 for more information. We have four Housing Officers who carry out Estate Inspections to make sure they’re being properly maintained and resolve any problems. Sites will be inspected at least twice a year, or more often for estates where there are specific issues. Residents are welcome to attend the​ estate inspections – you can view the Inspection Schedule or call 0115 916 6066 for more information. We hold a number of community days and events throughout the year, which might include entertainment, food, music, stands and information from us and other organisations. Follow us on Facebook to keep updated or look out for our postcard invites. If you have an idea for an event or community day or you would like to get involved, please contact us or call 0115 916 6066. We have joined forces with Nottingham City Homes to give our residents the chance to access their Tenant Academy, which offers courses on personal development, IT, employment skills, health and wellbeing, and much more. If you would like at go on any of these courses, please contact us. Feedback from our residents is the best way we can continually improve our services. If you have a comment, compliment, complaint or suggestion, you can use our feedback form to let us know. We use an independent organisation to run regular residents satisfaction surveys on our behalf. Residents are chosen at random, so you may be asked to answer a telephone questionnaire. We really value your feedback, so if you get the call, please spare a few minutes to share your views. Sometimes a member of staff might contact you to find out your views on a particular subject – everything you tell us helps us make decisions about Tuntum about the services it provides. Residents are welcome to apply for a position on our Board whenever there is a vacancy. Being a Board member means you can help shape the strategic direction of the organisation. For more information on our Board, including vacancies and the application process, click here. 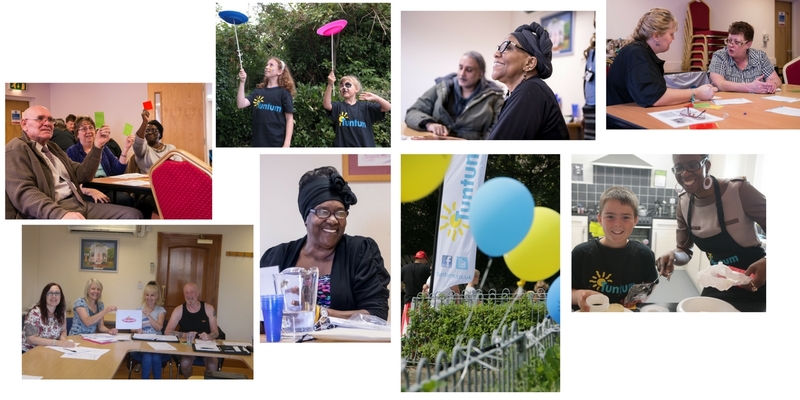 If you have ideas about how to improve your community or the service you receive from Tuntum, contact us or call 0115 916 6066.